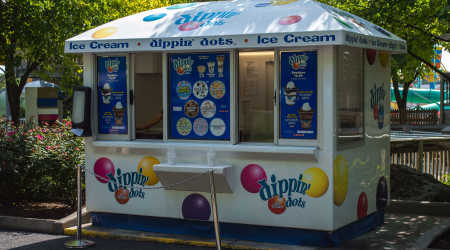 Enjoy a sweet treat at our Midway America Dippin Dots, located near Wildcat, featuring Dippin' Dots sundaes! Chocolate Syrup: High fructose corn syrup, corn syrup, sugar, water, cocoa *, contains 2% or less of: potassium sorbate (a preservative), salt, mono and diglycerides *, polysorbate 60 (an emulsifier), xanthan gum, and vanillan, an artificial flavoring. *Adds an eligible amount of fat. Oreo Cookie Crumbs: Sugar, enriched flour (wheat flour, niacin, reduced iron, thiamine mononitrate (viamin B1), riboflavin (vitamin B2 & B3), folic acid), palm and or high oleic acid, canola and or soybean oil, cocoa (processed w/ alkali), high fructose corn syrup, baking soda, cornstarch, salt, soy lecithin (emulsifier), vanillin - an artificial flavor and soy lecithin. Reese's Peanut Butter Cups: Milk chocolate (sugar, cocoa butter, chocolate, nonfat milk, milk fat, lactose, and soy lecithin and PGPR (emulsifiers), peanuts, sugar, dextrose, salt, and TBHQ (preservative). Whipped Cream: Cream, nonfat milk, corn syrup, sugar, mono and diglycerides, natural and artificial flavor, carrageenan, propellant, nitrous oxide. Contains: Milk. No sugar added Vanilla – Milkfat and nonfat milk, maltodextrin, whey, sorbitol, mono and diglycerides, cellulose gum, locust bean gum, cellulose gel, aspartame, carrageenan. Brownie Batter - Ice cream: Milk, cream, sugar, corn syrup solids, cocoa processed with alkali, salt, artificial flavoring, less than 0.5% of (mono & diglycerides, guar gum, carrageenan, locust bean gum), caramel color, red #40. Brownies: Sugar, margarine (liquid soybean oil, partially hydrogenated soybean oil, water, salt, whey, soy lecithin, soy mono and diglycerides, sodium benzoate, artificial butter flavor, beta carotene, vitamin A palmitate), enriched wheat flour (wheat flour, thiamine mononitrate, niacin, riboflavin, reduced iron, folic acid), fructose, pasteurized egg, cocoa processed with alkali, water, natural cocoa, brown sugar, unenriched wheat flour, partially hydrogenated soybean oil, baking powder (sodium acid pyrophosphate, sodium bicarbonate, corn starch, monocalcium phosphate), glycerine, powdered sugar (sugar, corn starch), natural flavor, potassium sorbate, salt. Mint Chocolate Chip - (Pasteurized/Homogenized) Whole milk, cream, nonfat mild solids, sugar, guar gum, carrageenan, blue #1, yellow #5, artificial flavors. Cookies N' Cream - (Pasteurized/Homogenized) Whole milk, cream nonfat mild solids, sugar, guar gum, carrageenan, natural & artificial flavors, vanilla. Cookies: Enriched flour (wheat flour, niacin, reduced iron, thiamine mononitrate (vitamin B1), riboflavin (vitamin B2), folic acid), Partially hydrogenated soybean oil, cocoa (processed with alkai), high fructose corn syrup, whey (from milk), cornstarch, baking soda, salt, soy lecithin, vanillin, chocolate. Cotton Candy - (Pasteurized/Homogenized) Whole milk, cream, nonfat mild solids, sugar, guar gum, carrageenan, blue #1, red #40, artificial flavors. Rainbow Ice - Water, corn syrup, sucrose, blue #1, red #40, yellow #6, yellow #5, artificial flavor, citric acid. Cookie Dough - Whole milk, cream, nonfat milk solids, sugar, guar gum, carrageenan, natural flavors, vanilla. Cookie Dough: Unenriched wheat flour, sugar, margarine (liquid soybean oil, partially hydrogenated soybean oil, water, salt, whey, soy lecithin, soy mono and diglycerides, sodium benzoate [preservative], artificial butter flavor, beta carotene, vitamin A palmitate), chocolate chips (sugar, chocolate liquor, cocoa butter, soy lecithin [emulsifier], vanilla), brown sugar, powdered sugar (sugar, corn strarch), water, butter (cream, salt), natural and artificial flavors. Frozeti Confetti- Water, corn syrup solids, sugar, natural and artificial flavors, blue #1, yellow #6, high fructose corn syrup, red #40, citric acid. Popping Candy: sugar, lactose, corn syrup solids, cocoa butter, powdered sugar, red #40, blue #1, yellow #5. Processed with carbon dioxide for popping effect. Contains: Dairy.